It’s no secret that I love the Twilight series of books and my next two giveaways are Twilight Inspired for all my fellow Twilight lovers out there. Please meet Jerry the owner of two fabulous Etsy shops- Shadesongs and Twilight Shades. This giveaway will be from Twilight Shades and I want to show you some of her beautiful designs that she offers. At Twilight Shades. 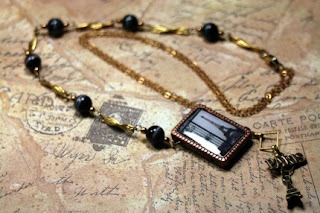 she offers vintage copper and brass jewellery in a very romantic, simple, Victorian and steampunk style. I love that these pieces are both timeless and elegant. Aren’t these pieces pretty? I wanted to get to know Jerry a bit better and find out more about her. It all began with a handmade bracelet my sister bought for me from a co-worker. When I wanted it in another color, she wasn’t making them anymore. So I did a bit of tinkering, and figured out how it was made. That was my beginning. My sister used to come over for the weekend, and we would be up all night make jewelry or other crafts, often raiding the 24 hour Walmart in town….at 2am! Now most of my supplies come from the trade shows in Tucson, where my Mom moved to 6 years ago. She called me to tell me about this sign for a bead show in Feb. when I goggled it, there are over 200! shows the first two weeks in February. So I come from PA, and my sister comes from Florida, and we met at Mom’s for beading, wine, and some very precious time away from kids and husband! But I must admit the first time my Mom handed me a glass of wine, it was a little weird even though I was 33 at the time! I am also a weekend Nurse on a Dementia unit and have been there for 13 years, and wouldn’t be anywhere else. I love my residents, their quirks, kindness, and tenderness. They also give the best hugs in the world! On Sunday we sit and read the paper with them, discussing current events, and past. Their stories are my inspiration, of loves lost, found, and loves still going strong. They keep you in the present, right here, right now, not thinking about what you are going to do tomorrow or next week. To be present is one of the most important lessons I think I have learned. I have one daughter in the delayed entry for the army, and another in high school. We have 2 therapy dogs, and a 13 yr golden retriever…and 6 cats! All of them strays we took in and got fixed. I am very open to others, and don’t allow the word hate in my house. About the only thing I truly dislike is Bullies. I think we all have a responsibility to defend and protect those who can’t. And to stop the spread of hate whenever we can. A bit of a Dreamer, I love Fairies, believe in magic, and and the power of thoughts. 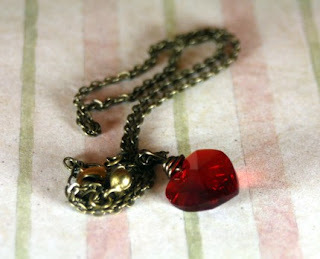 Jerry from Twilight Shades has generously offered one of my readers the Edwards Heart Bella RUBY RED Crystal Necklace! For those who like it simple, this one is for you. Its made with a stunning large Swarovski crystal with a sparkle and shine like nothing else…read cheap imitations….can’t match! 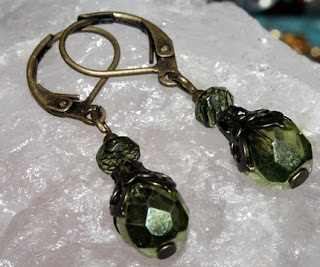 Put on a delicate 16 inches antiqued brass chain, with a two inch extender chain. Its retail value is $24.99 USD. Simple, romantic, just like Bella would wear! A wonderful gift! Since Edward is taken. Check it out- isn’t it so pretty!